A night ride back from the Clinton County Fair in Carlyle, Illinois took us through Trenton, Illinois over the weekend. Trenton is a small town with a small City Hall, but their City Hall is no cookie-cutter box or faux colonial meeting hall. 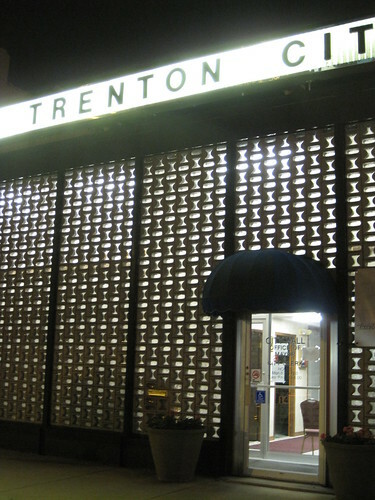 No, Trenton has a cool modernist building that was probably inexpensive to build — again, small town with small city hall probably has small budget — but is a delight to behold. The entire front wall consists of patterned glass blocks (specifically, the Intaglio Glass Wall Unit) laid in between black-painted steel piers. these glass blocks are laid in a neat pattern. At center is a simple, common metal door with a delightfully curved handle. Across the top is the name of the building on a backlit plastic board (paging Robert Venturi). While the plastic board is a little out of synch with the simple, smart design below, the composition works. 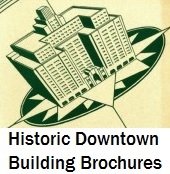 Trenton’s leaders settled on distilling the importance of municipal government into as direct an architectural statement as possible. While many towns across Illinois opt for allusions to classical architecture, or headquarter their government in plain-ugly, workable buildings, Trenton chose modern. Oh, I hope that their future leaders recognize and cherish the small wonder of City Hall! This entry was posted in Illinois, Mid-Century Modern, Southern Illinois. Bookmark the permalink.